. إن حسن الضيافة والخدمات الراقية التي تعرف بها Wyndham Hotels & Resorts تغني تجربتك في Days Inn Tamuning. يمكن الاستمتاع بمجموعة من الخدمات على أعلى المستويات في الفندق كمثل واي فاي مجاني في جميع الغرف, مرافق مخصصة لذوي الاحتياجات الخاصة, واي فاي في المناطق العامة, صف السيارات, خدمة الغرف. بالإضافة لهذا,تتضمن كل غرف الضيوف مجموعة واسعة من وسائل الراحة . بعض الغرف توفر حتى تلفزيون بشاشة مسطحة, اتصال لاسلكي بشبكة الإنترنت (مجاني), غرف لغير المدخنين, مكيف هواء, خدمة الإيقاظ لإرضاء أكثر الضيوف تطلباً. كما أن مجموعة الخدمات الواسعة الموجودة في الفندق لضمان راحتك تترك لك الكثير من الخيارات لقضاء وقتك أثناء فترة إقامتك. 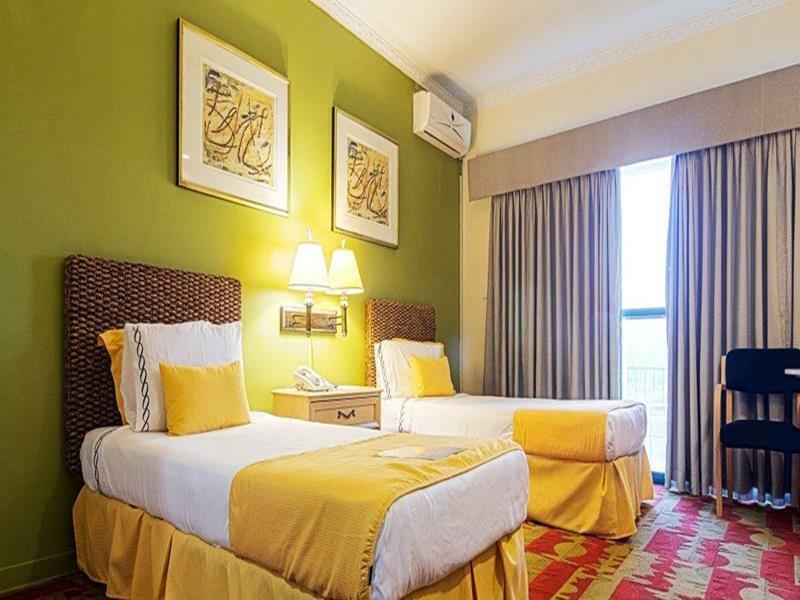 إن Days Inn Tamuning هو خيارك لخدمة الفنادق الراقية في جوام. يوفر العقار خدمة الانتقالات بالحافلة من/إلى المطار نظير رسم إضافي على النحو التالي. يحظى الأطفال بعُمر 23 شهرًا فأقل بهذه الخدمة مجانًا. الحجز المُسبَق مطلوب. يُرجى الاتصال بالعقار للحصول على مزيد من المعلومات. We arrived in Guam head on with storm Wutip at 1230 hrs. We decided to rest for the day and paid $50 for early check-in. Check-in time is at 1500 hrs. Request for a room near the lift was facilitated by Crystal. Comfy bed and pillows. Cool a/c dried our wet luggages. Miniref, microwave oven, hair dryer, iron with ironing board and hot shower allowed us to recharge from an early morning trip. Hotel shuttle always on time with reliable and good driver Oki. Friendly hotel staff Yvonne allowed us to use the hotel umbrella when we went out with a drizzle outside. Convenience store just accross the street. We enjoyed our stay and shopped til we dropped from exhaustion. Are we going to stay at Days Inn when we return to Guam? Absolutely!!! It was disappointing at first since we were not allowed for an early checkin at 6AM, but they let us slept at the lobby sofa. The receptionist was snob but later on became accommodating afterwards. 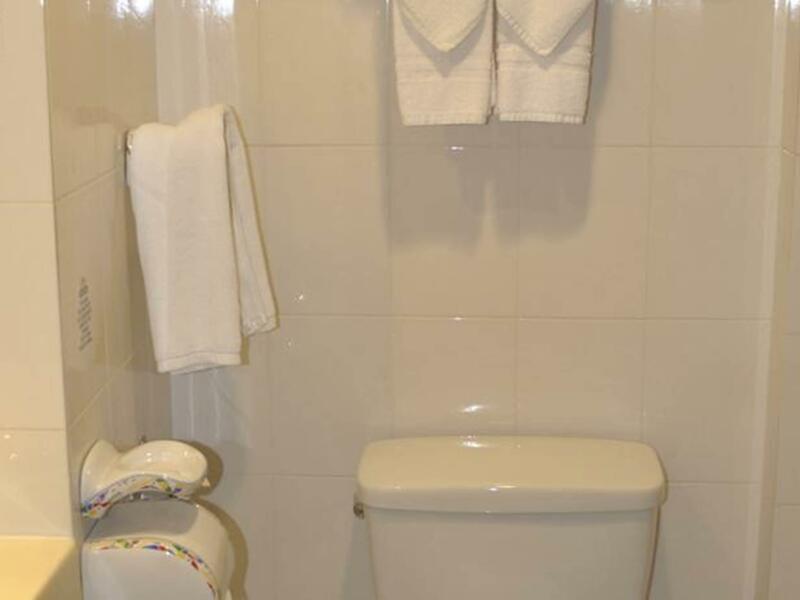 The room was okay but the bathroom has no bidet and exhaust fan. The free and reliable shuttle service to major areas was definitely a plus and saved us a lot of money anf time than taking a cab or bus. If you are only after shopping, then stay in this hotel. Otherwise, stay somewhere near the beach. Room was clean and convenient. Lots of stroes were near there. Good location, nice place and comfy beds. Equipped with self-laundry service. Staff are friendly. 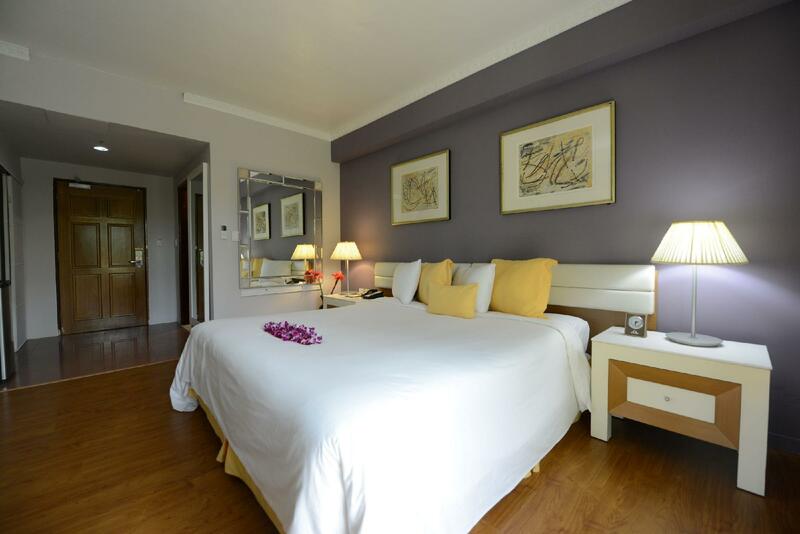 The queen size beds are a bit small for 2 persons each. We were not provide with drinking water for 2 out of 5 days stay. Despite our requests, we still received only 2 towels and 2 drinking waters though we have 4 staying in a room. We were told that they were either running out of towels or drinking water every time we asked. The daytime younger lady reception is helpful and friendly than the night shift lady. Good price with standard facility. 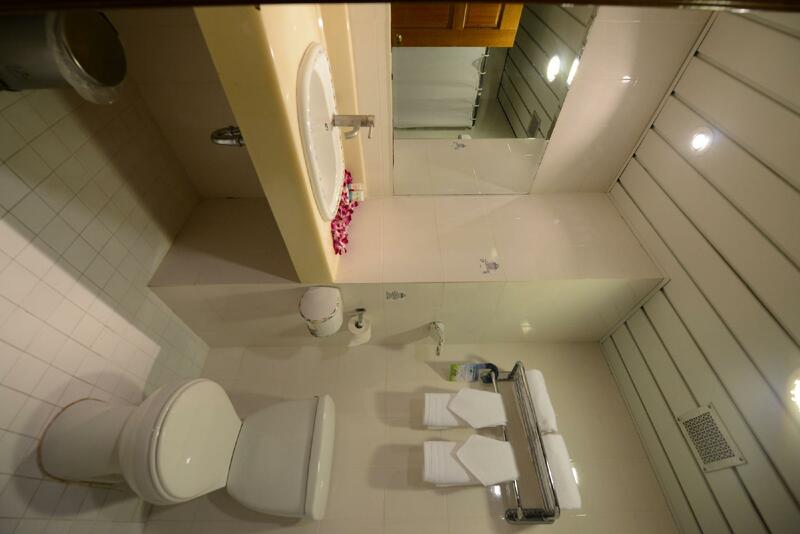 location = 3, because far away from the city center or GPO. But easy to reach from the airport. About 15 USD ride from airport. Can walk to GPO, but not preferable at night. Small shop is located abeam, open 0530-2230. This place is very nice close to the air port in Guam they do have a shuttle to take you to 4 places in Guam for free one of them is the beach and T-Galaria and the plaza and the last place is Guam premier out let or ( GPO ). the staff are really nice and the rooms are equiped with Microwave oven and a refrigrator so it is nice bring in some food and eat in the room, the place is very clean I strongly recommended. It was our first time to go to Guam. There were four of us, me and my husband, Noli and our friends, Jess and Zeny. We stayed at Days Inn but ate our breakfast mostly at Wyndham. A free shuttle brings us there as well as take us back to our hotel. Guam in general is laid back when compared to mainland U.S., but I liked its serenity and simplicity. I feel secured being there and roaming around the city without seeing policemen or guards. We’re definitely going back – with my whole family, my children and grandchildren on my 1st grandchild’s 4th birthday come June. I would like to especially cite the name of Solly, a receptionist at the lobby, who was so nice and helpful to us. She was that time pregnant, yet she exuded genuine concern and utmost willingness to help make us feel good and thus, enjoy our stay in Guam. Such a lady! Special mention as well, in Brandon, who like Solly, made our stay cool and comfy. Mrs. Nenita Santos Pandi, Bulacan, Philippines. 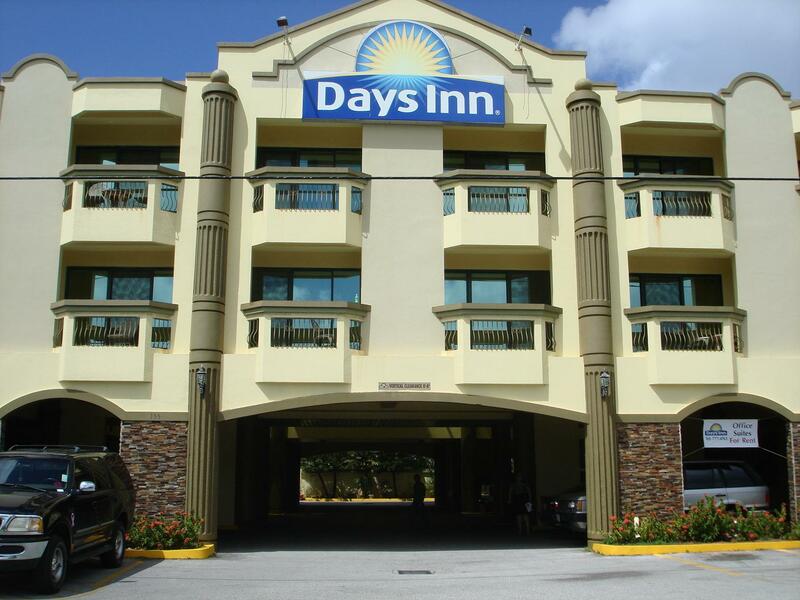 Days Inn Guam is near the airport and is at the center of places of interest in Guam. Staff are courteous and accommodating especially Miss Jennifer Aguirre the manager. I booked a three-night non-refundable room but have to cut my trip short of one day. I requested for early check-in as well as airport transfer which were granted cheerfully. The hotel has free shuttle to and from the beach, GPO (Guam Premium Outlet), The Plaza and K Mart. Hotel drivers: Jack and John were very helpful and cheerful in answering guests queries. Room was spacious, hot shower gets hot fast, bed is comfy but pillows are a bit bulky. There is a ref, microwave oven, water kettle, iron with board and hairdyer in the room. The cafe serves breakfast and lunch only but I did not try their food. A convenience store is just across the street. Elevator a bit old with a funny sound when in use and a bit noisy if you are booked near it. Wi-fi was fast but my room is just above the lobby. Great stay. RECOMMENDED! I have stayed here 2years ago I think. And one of staff remembered me I don't know why, but Im so glad you remember me, Yvorre! And next time I will book Days INN so can you work there. And other staffs were very kind and nice, smiling. I like this place very calm and kind. And room is clean. There were microwave, refrigerator, pot, iron and dryer. And when I use a dryer at bathroom, that was broken. And I was thinking..what should I do..and I found another dryer at closets. I was so glad to find it, I needed it. Thank you . And if you stay here should rent a car if you possible. Very useful. But very close to the shop, walking distance to Dannys. They have a free shuttle to Ypao beach, kmart, GPO and The plaza. Always on time especially when you're driver is John. Also, the front desk attends to all your needs, let it be a scissors in the middle of the night, a weighing scale, water for drinking or clean towels. Jennifer of the front desk is very helpful especially in teaching us directions and on how to get there the cheapest. Food is good there as well. Rooms are okay. Maybe they should just do some changing on their lights, plugs and aircondition cleaning once in a while. I was satisfied with the service of this hotel. It's near airport. Their free shuttle service to GPO, Ypao Beach, DFS Galleria and Kmart was a big plus. Staff were very helpful and accommodating. I'll recommend this hotel to friends and family. And I'll definitely stay at this hotel next time I visit Guam. staff. room condition. affiliation with aquasuites. Staffs were super nice. Although there were no much to eat nearby the motel, I could have Denny's and PapaJohns within 10 minutes of walking. Recommend for people who go to Guam for taking exams. Definitely not for the family. My reservation was not honored and they were fully booked, the desk clerk was excellent and bumped a guest who hadn’t arrived yet to accommodate me. The sheets were extremely dirty with a black stain in the middle. The sink was clogged and wouldn’t fully drain. The shower had low pressure. The bathroom had water noises coming from it. Better choices in Guam for the money. The hotel compensates its off location with the free shuttle service. Kudos to all the drivers who were always prompt, courteous and reliable! Value for money! They offer free shuttle to most shopping areas. Room is clean but the faucets in the comfort room had lots of rust.